As it turns out, Lindsey did! 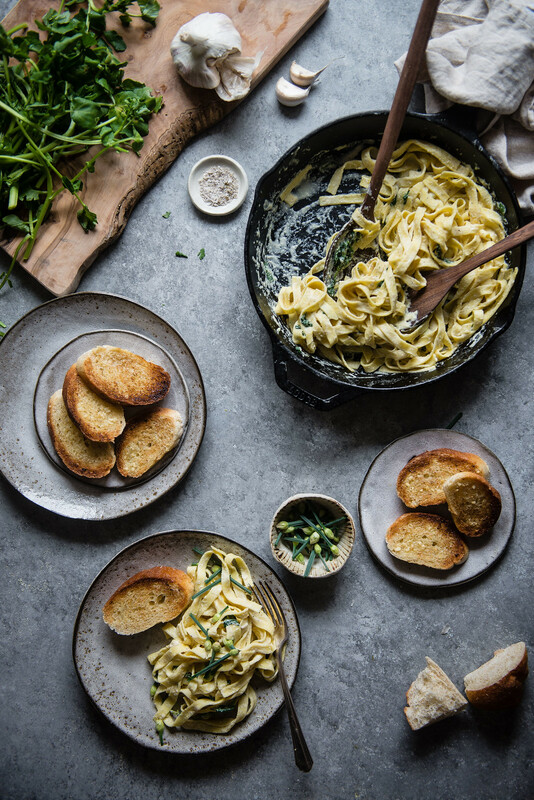 Lindsey from Dolly & Oatmeal is one of the loveliest people I’ve had the pleasure of knowing, and she dreamed up this alfredo, plus about ninety or so more recipes using chickpea flour in the same ingenious, delicious ways for a brand-new cookbook, out in this world as of today. 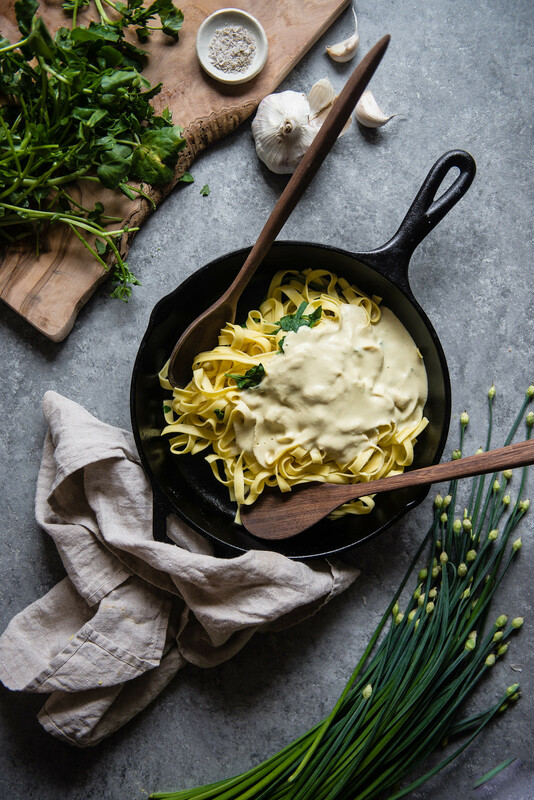 It’s called Chickpea Flour Does It All, and, just like this alfredo of hers, it’s wonderful. Lindsey’s book is gluten-free, dairy-free, vegetarian, and, like the title suggests, entirely devoted to chickpea flour, but the magic of it is that the book takes you through a full year of beautiful, seasonal recipes without once making you (or more precisely me, the gluten glutton) think that it was tied to any one ingredient, or any one diet. 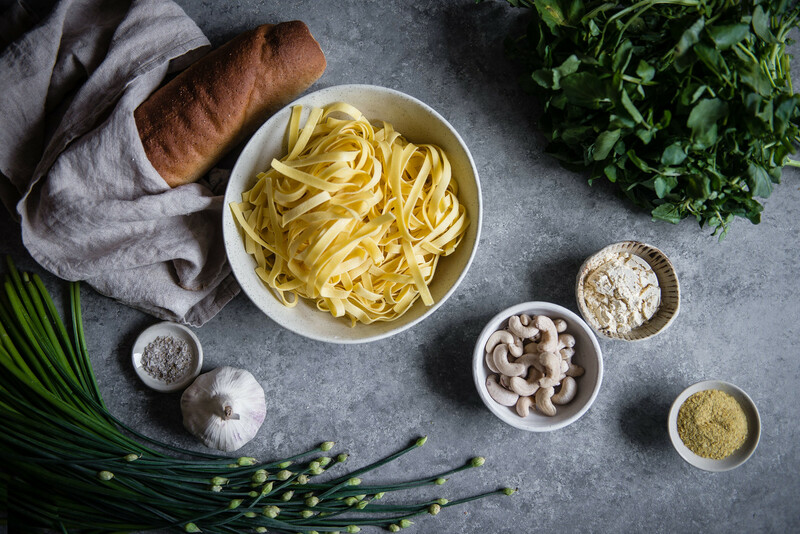 Instead, it’s two hundred pages of diverse recipes for meals, desserts, snacks, and other goodies that, quite simply, I can’t wait to cook and eat — and when I have, it’s the kind of meal that leaves me feeling better, and more nourished. In that way, it reminds me of Lindsey’s blog and Lindsey herself, in that every visit to her space or visit with her inevitably leaves me feeling brighter, happier, and more content. It’s a quality I find truly special, and a book imbued with that same light and sunshine is a real treat indeed. Begin cooking the pasta according to the instructions on the bag. While the pasta is cooking, make the sauce. Lindsey sounds like a true genius. This recipe seems delicious: what a great idea to use the chickpeas! She really is! The chickpea flour adds a body to the sauce that is so satisfying. Thank you for stopping by! 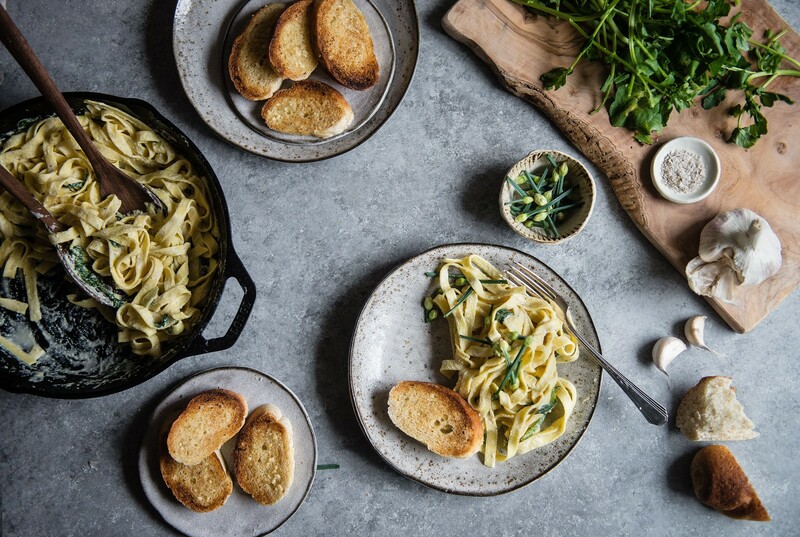 If you like this recipe, I imagine you’d also love sweet potato alfredo, too. With plenty of nutritional yeast, of course. Lindsey’s recipe is a winner, for sure. Thank you so much for the kind words! I love your photography here, Cynthia! The contrast in colors is really beautiful. I am totally with ya too on the rarity of alfredo in my diet. It’s just so carb-filled and creamy and decadent that I rarely let myself have it. Love your lighter version here! This pasta looks fabulous! Loving the use of chickpea flour here 🙂 Pinning! I always talk myself out of something indulgent and into the greenery and protein… but this looks like the ticket! I’ve never worked with chickpea flour before, but I’m crossing my fingers I win the cookbook! This is such a unique pasta!! Love, love love the sound of this! I’ll be honest, on first glance this sounds like something I’d be skeptical about. However, the pictures are lovely, and your description of the sauce is very convincing. I’m going to go hunt down some chickpea flour. I’m totally with you on the whole avoiding-alfredo-things, which is why I love these cashew-based “cheese” sauces! Can’t wait to try Lindsey’s version with the chickpea flour roux added in for more depth. Lindsey is a boss and you totally bossed sharing this recipe of hers. Beautiful! This looks amazing. Beautifully photographed as always and I love that you’re experimenting with Lindsey’s book! I love reading her blog too and so excited to try out some of these great recipes. I have a load of chickpea flour in my pantry just begging to be used. Be well! This looks and sounds deliciously perfect. I had a feeling this was from Lindsey’s new book! It sounds incredible! And your photos! Stunning as always, Cynthia. Love, love, love. Hope you are having a wonderful start of spring Cynthia! 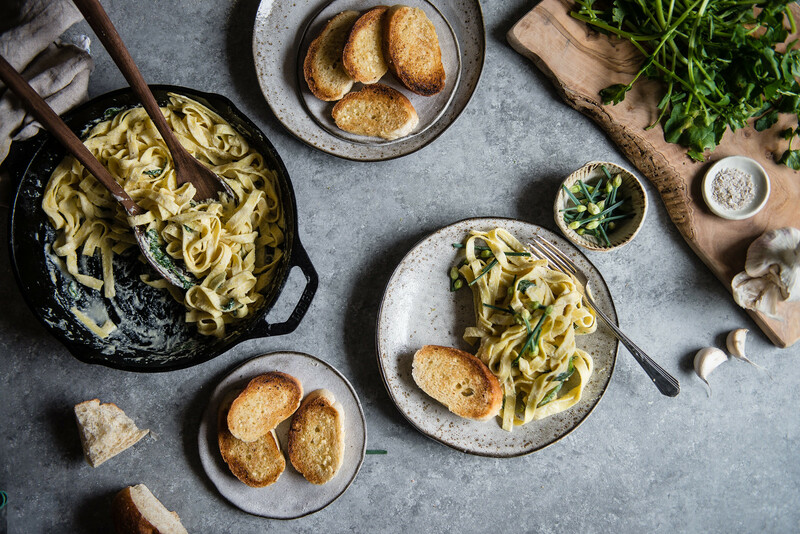 gosh, you make this recipe come to life in such a beautiful way. consider me forever grateful, xo’s! Beautiful read, Cynthia! It helps me see more into the character people truly have in real life. And chickpea DOES seem to do it all. This looks so good and what’s better than feeling good after eating a supposed “heavy” meal? Chickpea flour is used a lot in Indian cooking, so it’s cool to see it in other settings. Plus pasta is the best! 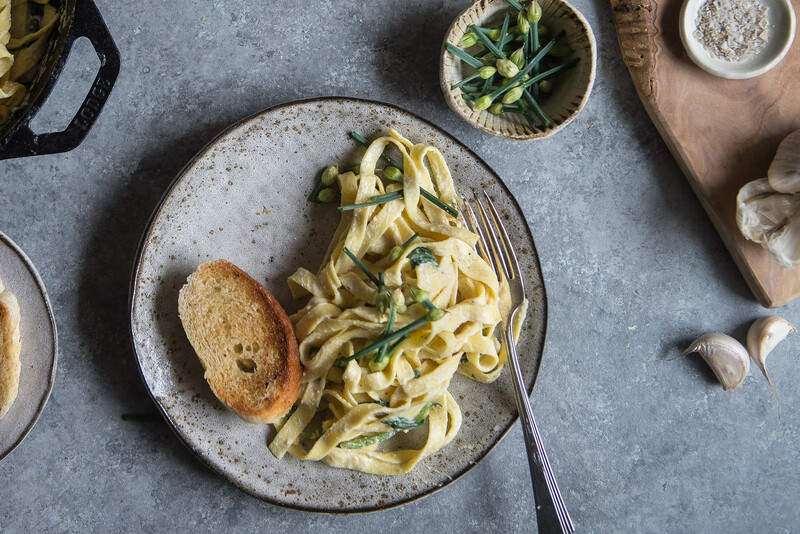 What a creative, healthy pasta dish! It looks delicious! Sounds great – still rich, but not overly so. I am not officially coveting your gorgeous cutting board! This is wonderful! I feel the same way about those cheesy pasta dishes (as much as I LOVE them). I love Lindsey’s recipes and served the sauce along with some spring vegetables in a pasta dish this weekend. The dairy-eaters raved about it and claimed, “it’s a keeper.” I’m now even more convinced I’ve got to get my hands on her new book. Thanks so much for sharing the recipe! I found this recipe (uncredited, I might add) on a different website. Glad I found it here, along with the recipe’s creator. I just had it for dinner and it was deelish. I didn’t have chives on hand so I tossed some blanched watercress into the blender, along with some steamed cauliflower. Freshly ground nutmeg makes it wonderful.